A Tempo this week (7/14 at 7 pm) visits with the four young composers participating in this year's New Jersey Symphony Orchestra Edward T. Cone Composition Institute, held this past week on the campus of Princeton University. Host Rachel Katz will host a roundtable discussion with Jonathan Cziner (Resonant Bells), Brian Shank (Into the Rose Garden), Aaron Hendrix (Night Train) and Natalie Dietterich (Aeolian Dusts) about their works and their experience at the week-long institute, which includes rehearsals with and a performance by the NJSO, under the baton of Maestro David Robertson, mentoring by Princeton professor and institute director Steven Mackey, and a variety of professional development workshops and trips. The program will also include comments from Maestro Robertson about the importance of the institute in the development of these composers' careers. 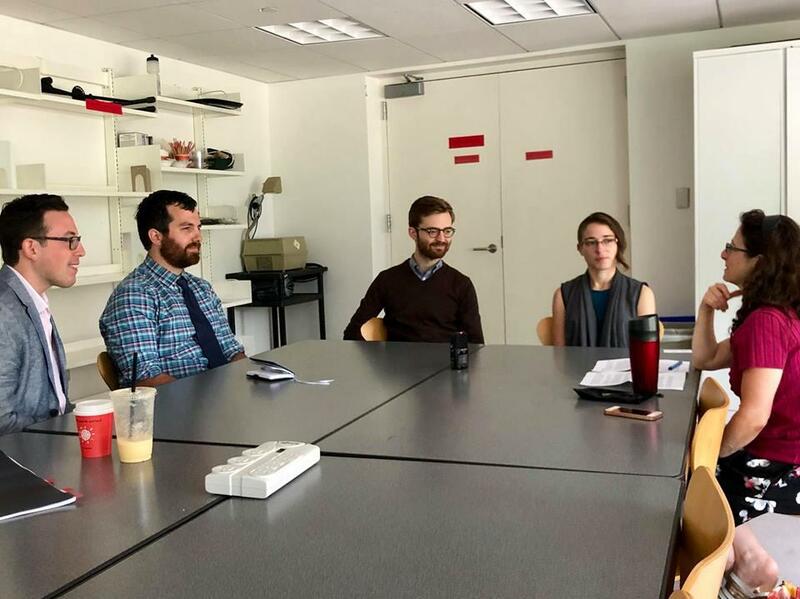 A Tempo host Rachel Katz (r) speaks with Cone Institute participants (l-r) Jonathan Cziner, Aaron Hendrix, Brian Shank and Natalie Dietterich. Additional excerpts from this week's Roundtable Discussion with the four participants of the NJSO Edward T. Cone Composition Institute.